A Tribute to Stephen Bruton who sadly died in 2009! The original song you will find on Vol.2 of the "Texas Blues" Project. It is a tribute to Stephen Bruton who sadly passed away in 2009. Stephen was part of the recordings from 2007 called Vol.1. 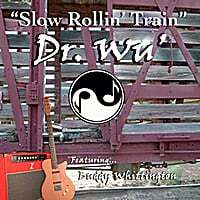 Bryan Freeze & Jim Ashworth, the masterminds of Dr. Wu' wrote the song and the great Buddy Whittington plays guitar on both versions. Take this song as an appetizer. To enjoy the whole meal buy one of the CD's or better the both they recorded so far! Great Job, Bryan, Jim & Buddy! Dr WU and friends are at it again. This time with the legendary Buddy Whittington on lead vocals and blazing guitar leads. This CD full of blues masters reads like a who's who of Texas Blues. Don't miss this volume.